This comprehensive anthology brings together 700 poems by more than 250 poetspanning over 1000 years. It includes a high proportion of contemporary,wentieth century work drawn from around the world and to make it easy to use,t is arranged into nine thematic sections, each of which is furtherubdivided. The selection majors on accessibility, favouring shorter andimpler work while not neglecting the work of those rightly famous andcclaimed. Here you can find poems to reflect on in a quiet moment, poems tose on special occasions such as weddings or funerals, Christmas or Easter,ove poems, poems to make you think and poems of praise. - Publisher This comprehensive anthology brings together 600 poems by more than 250 poets spanning over 1000 years. It includes a high proportion of contemporary, 20th century work drawn from around the world and is arranged into nine thematic sections. 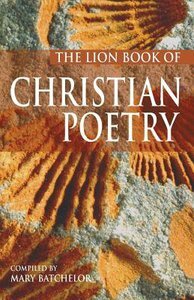 About "The Lion Book of Christian Poetry"
This comprehensive anthology brings together 600 poems by more than 250 poets spanning over 1000 years. It includes a high proportion of contemporary, 20th century work drawn from around the world and is arranged into nine thematic sections.